Many years ago, on October 26, 1818, Michigan Territory was divided by an Act of Congress into three counties: Brown, Crawford and Michillimackinac. In 1818 Brown County consisted of most of modern day Eastern Wisconsin. Between 1818 and 1823, a lack of judicial infrastructure in the then Michigan Territory necessitated that most important court matters meant a boat trip to Detroit. To improve upon this system, Governor Lewis Cass administered the oath of office to James Duane Doty on June 30, 1824. Judge Doty’s circuit included what is today the Upper Peninsula of Michigan, all of the present day state of Wisconsin, and even a part of eastern Minnesota. For a location of the county seat, Cass authorized a location close to the Fox River in present day Allouez that is today occupied by Heritage Hill State Historic Park. The establishment of the Wisconsin Territory in 1836 created the necessity for a change of the county seat of governance. A referendum on the matter resulted in a split between the towns of Astor and Navarino, and a majority of the votes favoring De Pere as the county seat which occurred officially on April 1, 1837. As De Pere had no suitable structure to act as a courthouse, the powers that be dragged the existing log courthouse from Allouez up the frozen Fox River to De Pere. 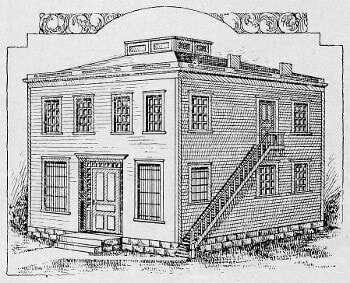 Within a year the log courthouse was replaced by a new two story frame building erected at the corner of George and Wisconsin streets in De Pere at a cost of $5,740. The first floor was the county jail plus quarters for the jailer and his family; court was held on the upper floor. De Pere remained the county seat for seventeen years until 1854 when Green Bay incorporated and second referendum resulted in the county seat officially moving to Green Bay. The old courthouse remained as the De Pere jail, and portions were even rented out for various purposes. In March of 1871, the De Pere courthouse building burned to the ground. 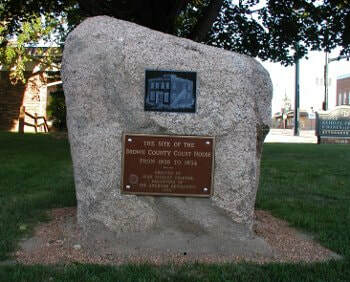 A stone marker erected in 1930 and rededicated in June 2009 now commemorates the location of the first Brown County Courthouse in De Pere. Special thanks to the following people and organizations for replacing the marker, which commemorates the site of the first Brown County Courthouse. Walsh & Walsh, S. C.